In order to ensure people can independently access and use a building the provision of visual contrast will assist in terms of a person’s ability to determine the extent of their environment. Whilst difference in colour alone can provide adequate visual contrast for people with good vision unfortunately this is not the case for all users of a building. 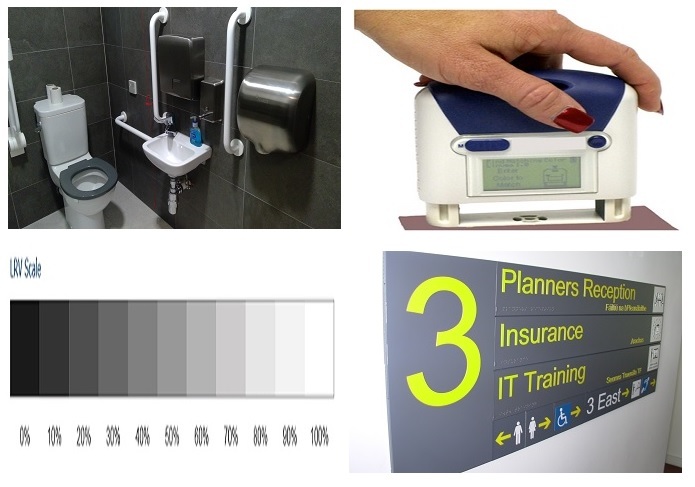 For people with vision impairments the main distinguishing feature of a surface is often the amount of light a particular surface/colour reflects which is known as its Light Reflectance Value (LRV). A surface’s LRV is the measurement of the percentage light reflected and ranges from 0% (black) to 100% (white) although 100% is not likely to be achieved. Measuring the percentage points difference between the LRV’s of two adjoining surfaces will determine the contrast between the surfaces. This LRV data is what enables Architects, specifiers, access consultants and designers to determine if adequate visual contrast between certain elements is being achieved. In general, where 30 points or more LRV difference is determined between adjoining surfaces adequate visual contrast is considered to have been provided. From a building regulation perspective, and where compliance with Technical Guidance Document Part M 2010 is required, it is important to ensure that elements of a building do not constitute a hazard for people with vision impairments. Edge protection on ramps with the ramp itself. Exposed edge of a gentle slope/ramp with surroundings. Step nosings with the tread and riser. Handrails with their background (e.g. wall or balustrade). Access zones, in on-site car parks, with adjoining surfaces. Elements projecting more than 100mm into lobbies/circulation routes. Glass doors with the background as seen through the glass. Glass doors adjacent to or contained within glazed screens. Door furniture with the door surface. Door, door frames or architrave with surrounding wall. Surface of a door’s leading edge with other door surfaces and surroundings. Door activation controls with their background. Manifestations on glazed screens with the background seen through the glass. Lift landing and car doors with adjoining walls. Lift call buttons/controls with the control panel face plate and in turn the face plate with the surface on which it is mounted. Lift handrails with surrounding surfaces. Surface finish of sanitary fittings and grab rails with their background. Between wall and floor finishes. Where manufacturers of building materials provide LRV data for their products designers and specifiers can easily determine whether adequate visual contrast is being achieved. Where LRV testing is required the use of industry standard colorimeter, used in accordance with BS 8493:2008+A1:2010 method of testing, is considered an appropriate means of determining a product or sample products surface LRV and this method of testing can even be completed on-site where necessary. Should you require any further information or advice and assistance in relation to LRV testing, please do not hesitate to contact one of our team on (01) 415 12 85 or e-mail [email protected].